Size of Male: 20-40 lbs., 19-22 in. Size of Female: 20-40 lbs., 18-21 in. Whippet dogs will remind you much of Greyhounds ? the lighter version, that is. This swift, svelte, long-legged breed comes in a variety of solid colors and color combinations as well as markings. This dog breed is so polite that it can join social get-togethers without making your guests uneasy. England is home to the Whippet. Crosses of some rabbit-poaching dogs and Greyhounds led to the present breed. If you ask some historians though, they will tell you that the elegant look of Whippet dogs today is because of the Italian Greyhound?s blood. Before the pooches became today?s show dogs and family pets, everyone called them the “snap dog” for their ability to track rabbits, and the poor man’s “race horse” for their rag racing prowess. The dog’s affectionate nature, usefulness and multiple talents have made the Whippet today’s most famous sighthound (dogs that hunt with speed and sight). The breed’s beginnings date back to the 18th century, but recognition was not given until almost a century after. Despite its standoffish disposition during dog training sessions, the dog is quite a fragile, little soul. You’ll be amazed at its gift to empathize with you and your family. It tends to be sensitive to touch, rough handling and harsh comments, and should be cared for by a gentle and harmonious household. The pooches are generally composed indoors and nimble outdoors. Living Environment – This dog breed is extremely intolerant of the cold. It’s never meant to sleep outdoors, although it may withstand a few minutes of open-air frolicking during chilly weather. Although medium in size, these dogs can adjust quite well to apartment living. In case your home does have a yard, remember to secure the fence because they will chase at moving objects and animals. Its agility and speed may be a deadly combination for the unsuspecting cat, rabbit or hamster. Grooming – These dogs don’t require much work in the grooming department. In fact, the breed is among a group of hypoallergenic dogs recommended for people with allergies. You need only to brush the hair coat once a week in order to maintain the sheen, and your Whippet is good to go! Baths may be scheduled twice a year. Diet & Exercise – You’re dealing with an easy-care breed, and diet is no exception. A combination of proteins, carbohydrates and some fats and vegetables in each serving is usual. See to it that the pooch is neither overfed nor undernourished. This dog breed’s exercise needs are on the average level, too. Satisfaction of this need is essential for the dog to stay well tempered and happy. While no extreme activities are necessary, be prepared to allocate at least an hour a day to play or jog with your Whippet. 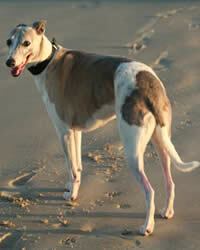 Health – Whippet dogs are one of the few medium dog breeds do not suffer from hip dysplasia. Genetic eye defects and dog allergies are an occasional concern for some. So is the dog’s sensitivity to anesthesia. Overall, this sprinting pooch is a picture of good health. Respect training is crucial for Whippet dogs. While there is no question about the dog’s intelligence, it’s the independent and sometimes manipulative nature of the pooch that you should brace for. Housebreaking should turn out much easier, but the actual difficulty will depend on your dog’s personality and your dog training style.